Genocide is good if your god commands it! 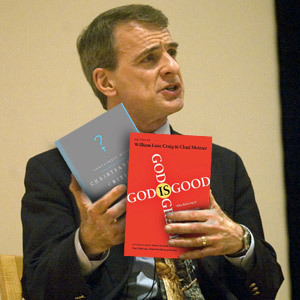 William Lane Craig went ahead with his “empty chair for Dawkins” stunt in his Oxford appearance. While many of his fans loved the trick, Craig didn’t get off unharmed by his stalking of Richard Dawkins. Obviously some of Craig’s fans are concerned about Dawkins’ reference to Craig’s justification of biblical genocide. So he was forced to confront the issue during question time. “However, in a question and answer session near the end of the debate, Craig’s response to the accusation that he approves of Biblical genocide provoked murmurs of disapproval from parts of the audience, and a loud boo from the upper wings. I suspect Craig will come to regret the way he has approached this problem. He has the habit of inventing explanations for things and sticking to them. even declaring his opponents are dishonest or illogical if they don’t accept his arguments. But when it comes to strong moral issues like genocide more and more of his fans will come to see these arguments as disingenuous. Especially if he repeats his justifications ad nauseam. A habit of his. Credit: Photo by Apolgetics 315. Yes the photo is doctored – but not by me.